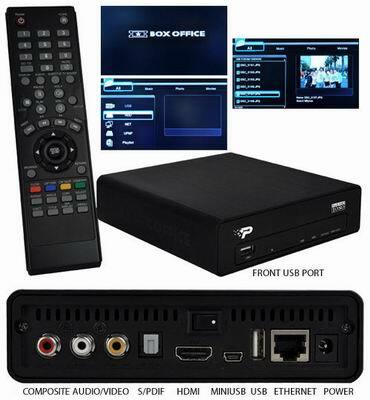 The Patriot Box Office is a media player that frees your digital media library from the constraints of a PC and bridges digital media to your home entertainment system to bring your entire media library to the comfort of your living room. With support for the most popular media formats (H.264, ISO, VOB, DivX, xVid, MKV, MOV, MPEG and more) you can remove the limits of your media collection. Box Office offers a variety of ways to connect to your media library: 3 USB ports, internal 2.5" hard drive (not included), UPnP streaming, 10/100 Ethernet connection and optional WiFi USB adapter.